Book Yourself Solid for This Summer Right NOW! Now is the time to start thinking about getting your calendar booked for this summer. 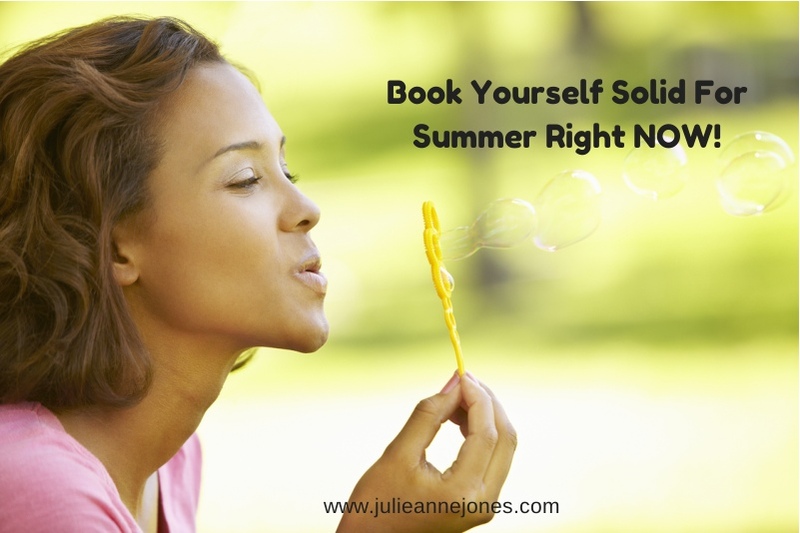 You've probably heard that it's difficult to get bookings during the summer. You may even believe it, but I'm here to tell you I know it's not true. If you approach bookings with the right attitude and you focus on being creative, you'll find your schedule for this summer filling up with enthusiastic hosts in no time. Here are my best ideas for "jump starting" the bookings on your calendar, especially if you don't have many to start with. Choose one or two out of the seven ideas below and watch what happens! Send a catalog to a friend, neighbor or co-worker who has moved. Put a catalog in the teacher's lounge at your child's day care. Put a catalog in your employee lunchroom. Give a catalog to the receptionist at your doctor or dentist office. Put current catalog in your neighbor's door. Include a 10% off coupon. Have your spouse or friends take a catalog to work. 2. Throw Yourself a Party. Find a reason to celebrate something (your company’s new products, your business anniversary, a promotion, working on a new incentive trip, the fact that it's summer) and invite everyone you know to come help you celebrate. Offer incentives if they bring a guest and host it as an open house to increase attendance. It could even be a fund raiser for your favorite charity. Work with other consultants in your downline or area and host a booth at your local county fair or summer bazaar. Check out local job fairs – they’re filled with people looking for work! Host an office party during lunch or after work. Attendance will be automatic! Host a restaurant party – the host doesn’t have to do anything except invite people and show up! Hold a “multiple host” event, holding several shows in the same place on the same night. 6. Make your Party a Booking Event! Create an awesome booking “commercial” which highlights the benefits of booking a show with you. At the beginning of the party mention your host’s goals. Have the hostess tell why she decided to host a party. Offer a gift wrapped gift to the host at your show; one booking, she takes off the bow, two bookings, she takes off the wrapper, three bookings, she gets to keep the gift! Offer “instant booking gifts” as a bonus for hosts who book on days and/or months you need to make a goal. Make your parties fun so your guests will want to book! Include a business card or flyer with ALL your bill payments. Wear clothing with your company logo on it. Have your business information printed directly on your checks. Call your realtor with suggestions for "new home packages". Carry a notepad to jot down names of potential hosts as you think of them. Do you have any ideas I missed?